In the midst of all the research reading I’ve been doing, I have managed to read a few novels for fun. I read the trilogy by Katherine Arden that began with The Bear and the Nightingale. I’d read that a few years ago when it came out, then somehow missed the second book. The third book came out recently, so I reread the first to refresh myself before reading the whole series. These are fantasy novels set in medieval Russia, built around some traditional Russian fairy tales and incorporated into bits of actual history. I’ve read some of the tales used in the story, but I’m not familiar enough with them to be able to say how much of these books are a fairy tale retelling and how much they’re something entirely new. At any rate, the result is a fleshed-out world and characters. The look at medieval Russia, which is apparently fairly factual, is almost like seeing something out of another world. It’s a very different place with an unusual (to modern eyes) culture, and their coping mechanisms for winter are interesting. It’s hard for me, a southerner, to imagine a winter so harsh that insulating your home with snow and ice keeps it warmer and the family would sleep on top of the stove. Then imagine traveling in these conditions, and putting coals from the fire in a trench, then building a pallet of branches on top of that to sleep on. The story follows a girl/young woman growing up in a small village north of Moscow, the daughter of a nobleman. There are stories/rumors about her mother and grandmother and the fact that they might not have been entirely human. Our heroine, Vasya, seems to take after them. She sees all the little spirits who occupy the land and their homes — the ones who care for the oven, for the home, for the stable, the trees, the waterways. But there are darker spirits out there, as well, and they’ve noticed her. Whether she can protect her people from them depends on whether she’ll be allowed to by her stepmother, who’s fallen under the spell of a vain and paranoid priest. Whether you want to read these in the winter and enjoy the atmosphere as you huddle under a blanket with a warm beverage or in the summer so that the trip to an icy land helps take you away from the heat is up to your own inclinations. I found them the perfect reading for a cold winter day. I put some Rachmaninov on the stereo, made some tea, and settled down for some vicarious traveling. The pacing of these books is rather leisurely, especially the first one. There’s a lot of time spent establishing the world and the characters and hinting at the looming threat before the action kicks into high gear. I enjoyed playing in that world before the action started, but if you like a fast pace and non-stop action, these might not be to your taste. If you like wallowing in an interesting setting, they may be more to your taste. The later books in the series do kick up the intensity and the stakes. These are definitely recommended to those who want something different from most of what’s been published as mainstream fantasy, or if you liked Spinning Silver and the Russian setting of that. I suppose I should be making some kind of Oscars commentary this morning, but I didn’t watch the ceremony, and I hadn’t seen any of the nominated movies. I think I saw three movies last year. Instead, I was watching the miniseries of War and Peace from a few years ago, mostly to laugh at the costumes (it’s set in the early 1800s in Russia, but a lot of the women’s dresses were more 1930s movie star or 1990s bridesmaid). I guess I fell into that because I was out of Jane Austen stuff to watch. When you’re sick, as I’ve been for the past few days, Jane Austen is the perfect source for things to read or watch. You don’t have to worry about characters dying, unless it’s a troublesome elderly relative dying offscreen to leave someone a fortune. You don’t have to worry about someone suffering more than a broken heart or the cold they get from getting caught in the rain. If someone we like gets jilted, we can rest assured that the jilter will be smacked upside the head with karma. The people we like and want to end up together will come out well and end up together, while the people we don’t like will get what’s coming to them. And all of this will happen in lovely dresses on nice, sunny days (unless the weather is needed for a plot point, like that rain to make someone sick). They may talk about needing money, but no one starves, and there are plenty of rich friends and relatives around to help ease the way. I’m reading a biography of Jane Austen right now, and it seems like a lot of that was wish fulfillment on her part because life was hard and bad things did happen. In her books, she was smoothing over the rough edges, even as she was unleashing the snark and using her pen to create karma that the real world didn’t provide. Now that I’ve made it through all that Amazon Prime has to offer, I need to get the hoopla app on my Roku up and running because I get that service through my library, and they seem to have the latest Northanger Abbey, which might be even more fun now, since Cathy is played by a young Felicity Jones, and after seeing her in Rogue One, that means I’ll be wanting Cathy to blow stuff up. But that may have to wait until the next time I’m sick. I’m on the mend now and less in need of comfort viewing. By the way, War and Peace isn’t good comfort viewing if you’re actually paying attention and not just snarking at the clothes or admiring the men’s uniforms. Way too much emotional turmoil, though there is some satisfying karma. I’ve been thinking more about tropes that call to me, and after my discussion of recent reading from earlier this week, I’ve got one to add: framing stories. That’s when the bulk of the novel is framed as a story being told or discovered in a separate story at the beginning and end (with maybe some in-between stuff) of the book. I think I first developed a fondness for this with all the Jack Higgins WWII thrillers I read in my teens. His usual pattern was that a nameless first-person narrator (implied to be the author) was in some place researching some element of history for a book he was working on, and then a mysterious stranger would approach him and offer to tell the real story that no one has heard. The novel would then be that story (told in standard narrative format). At the end, the mysterious stranger would finish his story, the author would be left pondering whether it could possibly be true, and then he’d find some piece of evidence that supported the story, and his mind would be blown. I think I liked this structure because it gave the illusion that the story might possibly be true, that it was secret history rather than just a novel. I like it even better when there’s an actual plot in the “present” part of the story, so that it’s parallel stories rather than just a frame. There’s something going on in the present as someone researches the past, and meanwhile we get the story of what happened in the past. One good example of this is Possession, by A.S. Byatt. Or there are things like The Thirteenth Tale or The Historian. One other thing that I like about this structure is that it’s a way to let readers know the long-term outcome of the characters after the end of the action — not just did they survive those events, but how did the rest of their lives go? The person in the present usually learns some of this information. You wouldn’t really be able to put that in a normal novel structure, but you can if part of the story is the person in the present researching it. It then becomes part of the resolution for the present-day character to learn that the characters in the past got married, had three children, started a successful business, and died peacefully in their sleep of old age. And, yes, something like this is on my literary bucket list. I have a plot idea that’s perfect for it, but it’s going to take a lot of research and some travel before I can write it. I read an article recently on why writers of all genres could benefit from reading romance novels, mostly because romance writers are experts at conveying emotion. Conveying emotion is something I struggle with (and possibly a reason why my romance writing career sputtered), and it’s been a long time since I read a genre romance novel (as opposed to a romantic novel or novel with romantic elements published in another genre), so I picked one up at the library. I seem to have found the book aimed directly at me. After a long day at work, the heroine doesn’t want to hang out with her friends. She just wants to go to the sanctuary of her home and read a book. She comes in the door, takes her glasses off, changes into comfortable clothes, and curls up with a book. I felt so represented. Alas, this is a romance novel, so the whole point of it is to get her together with someone, so by the end of the book she’ll have realized she was wrong and it’s better to come home to someone. And it looks like she’s not treating her home as a sanctuary because she’s truly an introvert and is happy that way but rather because she’s been hurt before and is afraid of intimacy. It would be nice if someone ever wrote a true introvert love story, where the heroine finds the person who fits into her solitude without being an energy drain and who enhances a life that was already good rather than her learning that her life is wrong and empty. But then there wouldn’t be any emotional conflict and drama, so you wouldn’t have much of a romance novel, and that may be why I drifted away from the genre. You can depict that kind of relationship if there’s some other kind of conflict going on, like a mystery or a battle against dark magical forces, but it makes for a pretty lame romance novel. Anyway, one of the signs early in the book that she’s damaged and wrong rather than just an introvert who’s figured out what works for her is that the guy comes to her place while she’s at home reading and figures out that she doesn’t actually need her glasses because she’s not wearing them at home. They aren’t near her book, so she doesn’t need them to read, but he asks her about a book on her shelf, and she can tell him the title from across the room. Aha! She’s using the glasses to make herself less attractive and to hide from the world. That was when I felt like I ought to speak up on the heroine’s behalf (except the book said he was right). I need glasses. I even have the corrective lenses restriction on my driver’s license to prove it. But I don’t wear glasses at home. I do just like the heroine in the book does. I come home, put down my keys, and take my glasses off. They live next to my keys. I have an older pair of glasses that lives on the coffee table for when I’m watching something on TV that has a lot of letters or numbers (like the weather report) or that I really want to focus on. I could probably tell you the titles of most of the books on my shelves from across the room because they’re my books and I know what I have, even if I can’t read the words on the spine from a distance. So that whole thing was bogus. I’m not far enough into the book to really have all the emotional stuff I’m reading it for, other than the heroine’s intense embarrassment when the guy pointed out his realization about her glasses. I’m afraid, though, that I’m not in his corner. That’s another one of the reasons I stopped reading genre romance. I seldom wanted the guy to get together with the girl because I usually didn’t like at least one of them and I thought the other one could probably find a healthier relationship somewhere else. I guess the whole point of this exercise, though, is that I need to turn off the analytical part of my brain and just surrender to the emotions, then figure out how the author does it. I did a lot of reading over the holidays, not all of which I’d necessarily recommend, but I did find some good books to share. If you’re looking for a good Christmas season read that isn’t necessarily a “Christmas” book, take note for next year to look for One Day in December, by Josie Silver. It’s a chick-litty romance that’s kind of like a British When Harry Met Sally in book form. On a December day, a young woman looks out a bus window and makes eye contact with a young man waiting at a bus stop, and there seems to be a moment of instant connection. She has an impulse to get off the bus and go meet him, but the bus moves on before she can act on it. He becomes something of a figure of fantasy for her, but she doesn’t see him again — until the next December when her roommate introduces her new boyfriend to her, and it’s the guy from the bus stop. The story follows this group of friends over the next decade. I’ll admit, I did want to throttle some of the characters some of the time, but they’re probably acting as you’d expect for that age and I’m just being old. On the whole, though, it was the kind of book you end up reading in one or two sittings because you want to know how things will work out and you need to get these characters out of the painful situations they find themselves in, like the dilemma of whether she should tell her roommate that her new boyfriend is the fantasy man they’ve been talking about for a year. Does it count that they’ve never actually spoken and she’s not even sure he remembers or recognizes her? Although the book is quite romantic, I think it’s really more about friendship. The holiday season plays a big role, and most of the major events happen during the holidays, so there’s some nice atmosphere, but it’s not really a “Christmas” book, so it’s good if you want something to kind of fit the mood but Hallmark movies are overkill for you. After Christmas, I guess I went the exact opposite direction because my next read was an urban fantasy called The Immortals, by Jordanna Max Brodsky. I’m not even entirely sure how I came to pick this up. I think the title of the sequel (which I now don’t recall) caught my eye in the library, then I saw that it was a sequel and looked for the first one. In this series, the Greek gods are still around and have taken roles in the modern day. They’re also gradually losing their powers and immortality as belief in them has faded. Artemis is our main character, and she’s now a private investigator in New York, specializing in protecting women from abusive men. She comes across a grisly murder that looks to her like a sacrifice from an ancient Greek ritual, and since it was a woman who was murdered, she considers it her jurisdiction. Meanwhile, a classics professor who knew the murdered woman has also recognized that it’s not just an ordinary killing, but he can’t convince the police of his theory. The two of them team up to solve the case. I’m not ordinarily fond of “the gods walk among us” stories, but this one worked for me because it was fun seeing how the Greek gods fit into the modern world (Apollo is an indie rock star, because of course) and how they’re coping with their relative weakness and looming mortality. I also like the professor. He’s pretty much my type of character (in the Owen and Lord Henry vein). If you like American Gods and that sort of thing, or if you like paranormal mysteries, this is something to look for. I’ll definitely be picking up more books in the series. Then I went to something completely different, a book I guess you could look at as the British version of Southern Gothic — the disintegrating family full of secrets. It was The House at Riverton by Kate Morton. It has a lot of parallels with Downton Abbey — same time period, similar look at what’s going on upstairs vs. downstairs. In a framing story, an elderly woman in the 1990s is approached by a filmmaker making a movie about an event that happened in the 20s at the grand manor house nearby. The woman is the only living person who was there for the event and the filmmaker wants to consult her. That sends her down memory lane, recalling how she went to work there as a housemaid as a teenager, just before WWI started, and how she became fascinated with the lord’s grandchildren, who visited often. The story follows them into the 1920s, when the narrator has become lady’s maid to one of the granddaughters. There are layers and layers to the secrets surrounding this family — secret loves, secret ambitions, secret motives — and they all build toward tragedy. It’s not exactly a light, fun read, but it is really juicy and probably something that fans of Downton Abbey will enjoy, with even more drama and scandal than in that show. It kind of makes me want to write something like that, but with magic involved somehow. I also like the idea of the framing story, of the person in the present tracking down what happened in the past. During the holidays, I saw a thing going around Twitter of people talking about what tropes make for an automatic “yes” on a book — if you see that thing mentioned on the back cover/cover flap, you’ll buy the book. Thinking about this, I don’t believe I have any because other things can balance it out or overwhelm the one thing I do like, but there are certainly things that get my attention, and when I think about those, they’re not quite what I’d have expected. One of the tropes I can’t seem to resist is magical memory loss. I pretty much hate anything to do with amnesia in romances, but put it in a magical (or possibly science fiction) setting, and I’m all over it. I love exploring the idea of what would you be if you didn’t know who you were — get rid of all the baggage and expectations, and what kind of person are you? I also like the related trope of magical false identity — due to magic, you’re given a fake identity and the memories that go with it. Can you tell that something’s wrong? Does your real self try to break free? 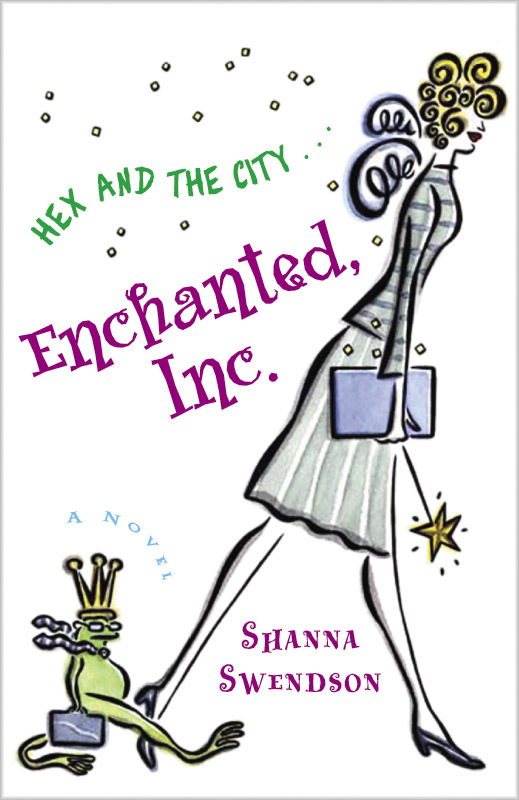 I had some fun with this in book 7 of my Enchanted, Inc. series. I know that the secret/hidden royalty trope is considered a cliche in fantasy, but I love it so much. I suspect I was heavily influenced by Briar Rose in Sleeping Beauty, who lived in a hut in the woods but learned she was really a princess. I think that escapist thing is a big part of the appeal of fantasy. You can imagine that you may seem ordinary, but could you possibly be someone important, hidden away? Give me an apprentice underwater basketweaver who turns out to be the long-lost heir (or possibly the child of the great wizard), and I’m there. I’m not quite as keen on the related Chosen One trope when it involves prophecy, but do love when the unexpected person turns out to be exactly what was needed or has abilities that no one would have thought to look for in someone like that. Portals! I love a portal fantasy. I think that’s because it makes it possible to imagine that I could have that kind of adventure. I don’t live in a fantasy land, but I love the idea that I could visit there (and if I turn out to be the long-lost princess, that’s even better). Colleagues into lovers — you have to work together to solve a problem/go on a quest together, and as you go through difficulties, you develop feelings? Yes, please. But only if you keep your priorities straight and focus on your goal. No pausing for a romantic interlude when you’ve got a deadline and the bad guys are right behind you. I seem to have a thing for charming thieves, which is odd because I can’t really stand the “bad boy” type, but when I see a Robin Hood kind of character — a thief for a good cause in a society where the usual rules aren’t working — I want to read it. No ordinary criminals, though. On the other hand, I also can’t seem to resist nerdy wizards, especially the guy who seems utterly inept, but that’s because his talents are so unusual that the typical training doesn’t work on him. He may not be able to do the most rudimentary spells that even young children learn, but he can do things that even the most advanced wizards can’t even imagine. There’s a lot of bumbling and angst before they figure out that he’s not utterly incompetent or clumsy, after all. I’m sure I have a few more book triggers, but I’d have to go through my shelves to figure out what they are because I’m generally not conscious of what it is that makes me want a particular book. And if I start going through my shelves, I won’t get anything else done all day. Eight hours later, I’ll be sitting on the floor in front of the bookcases, re-reading a book I hadn’t thought about in ages. I finally get a bit of a break today from holiday craziness. Last night, the women’s group at church had our party, a spa night at a nail salon. I’m not a big manicure/nail polish person, but getting the hand and arm massage was nice. We’ll see how long the polish lasts. It feels weird and that might drive me crazy, unless I get used to it. I think some of the problems I’ve had putting on polish were because I was doing it wrong, based on what I watched from the professional doing it. And now I get to actually be at home this evening. I don’t have to deal with people today, so maybe I’ll get more work done. I’ve been reading some Christmassy books, with mixed results. I read one that was the designated Christmas entry in a series I’ve been reading, and it was okay, though the author really should have done more research. The book’s set in England, and there’s a character who’s an American estranged from his family. In this book, his brother shows up, and he’s the stereotypical racist, sexist, homophobic redneck. He’s from a hick town, and you can see why the regular character fled this town that was so isolated from anything resembling culture. The brother has his horizons expanded because for the first time in his life, he’s met people from another culture, and when he meets the town’s Muslim doctor, it’s the first time he’s met someone from a different religion. And then there’s an offhand reference to the name of the town these characters are from, and I had to laugh out loud (and then pretty much disregard the book). The author must have just picked a town name without doing any research about the actual town (or making up a fake town) because it’s the town adjacent to me (I live in a little bubble of one city that’s isolated from that city but practically a part of this other town, and I live in that town’s school district in spite of having a mailing address from the city). We’re talking about a town of about 40,000 population, with a per capita income of about $200,000. It’s the place a lot of executives live. It has one of the top school districts in the nation, is home to some major corporations, and is adjacent to a major international airport. It’s less than a half-hour drive to downtown Dallas. The population is about 30 percent Indian, and it’s one of the most ethnically and religiously diverse areas in the nation. In fact, the world religions other than Christianity are more represented in this town than just about anywhere else in the United States. Now I’m reading a book that’s a gender-switched telling of Pride and Prejudice. I remember around this time last year I wondered if anyone had done that. This one is so very different from what I had in mind that I think I could still do mine without anyone thinking I’d copied it. I might even get wacky and not make any obvious references (like names), and see if anyone notices what I’m doing.